Chinese mobile advertising firm CASEE has received $6 million from London mobile marketing company Velti, which takes a 33 percent stake in the start up. Velti also has warrants for a further 17 percent, which would increase its stake to 50 percent for an extra investment of $3 million. 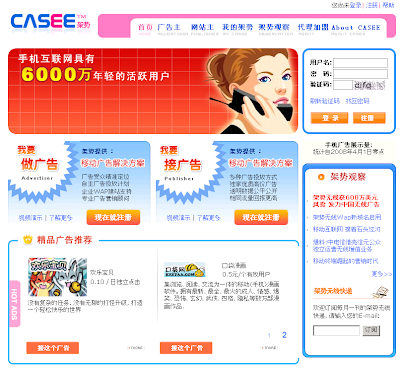 CASEE runs an online mobile advertising exchange at Casee.cn which resemble Admob business model in which advertisers can bid for ad space, and WAP site operators can offer inventory. The two-year old company reports that it serves over 500 million ads a month on 3,000 WAP sites in China. A big congrats to Xin Ye, a good friend of mine who is the founder of Casee. All the best to him and his team at Casee.